Sarah Teibo's upbringing has some aspects that are typical and others that seem atypical, but may not be. The Brit of Nigerian descent began singing in church at the age of 10, and she grew up in a home filled with both Motown music and the gospel sound of the Clark Sisters. So Teibo was touched by the music of Detroit while she was living in England and Nigeria. A woman of strong faith, Teibo gravitate toward gospel music and she was pulled into that orbit when the gospel duo Mary Mary visited her church, and the two sisters rose to their feet when Teibo began singing. Teibo is a wife and mother who also had a career as an accountant that preceded the release of her debut gospel/inspirational album Walk With Me. Is that atypical? In a world where mainstream acts have been pursuing a deal all of their lives perhaps? However, Teibo’s story mirrors plenty of indie and gospel acts. It’s fitting that Teibo gained confidence in her musical ability from witnessing the Campbell sisters’ response to her singing because “Steal My Joy,” the first release from Walk With Me, is an upbeat number that fuses funk with modern R&B production techniques and resides in a thematic territory visited often by Mary Mary. On the song, Teibo reminds listeners that it is often the mundane inconveniences and disappointments of life that frustrate us and that remaining positive requires the effort of being in control of our emotions and putting things in perspective. The track probably falls more on the inspirational side of the gospel-inspirational spectrum. “I Will Sing,” is an upbeat track that features African percussions and would be a welcome addition for praise teams looking for new material, while “Keep The Faith” is another track that uses hip-hop infused R&B production techniques to deliver a classic R&B message about trusting in God’s word. The mid-tempo “Save Me,” finds Teibo lending her buttery vocals to a classic gospel/soul song pleading on God’s saving power. 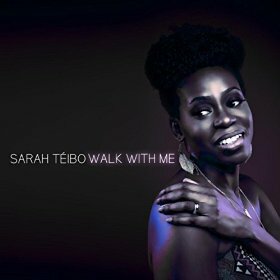 Teibo’s Walk With Me is a record that in some ways stretches the definition of classic gospel. She clearly has a comfort with wading into contemporary production, but whether she is cutting edge or classic, the traditional message of God’s love remains present throughout, and this is a solid debut from an artist with a bright future. Recommended.